Showing results for tags 'usa today'. Nickname came first at North Texas? 'Mean Joe' Greene or Mean Green? mean joe greene or mean green? Thought this was an interesting article. The good news is that we would have made the cut! Always fun to see how they rank everyone. 42. East Carolina (6-2, 3-1) 45. 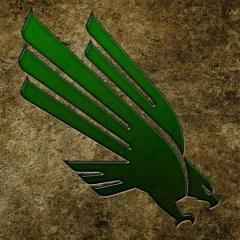 North Texas (6-3, 4-1) – UP 20 55. Marshall (5-3, 3-1) 57. Rice (6-3, 4-1) – DOWN 10 72. Tulane (6-3, 4-1) – DOWN 32 74. Middle Tennessee State (5-4, 3-2) 89. UTSA (4-5, 3-2) 95. Louisiana Tech (3-5, 2-2) 97. Florida Atlantic (3-6, 2-4) – UP 9 100. Tulsa (2-6, 1-3) – DOWN 5 113. UAB (2-6, 1-3) 115. UTEP (1-7, 0-4) 117. Florida International (1-7, 1-3) 122. Southern Mississippi (0-8, 0-4) Read more.